Four Hawthorn players (Gibson, Mitchell, Hartung and Smith) have tallied 30 or more disposals, all with 80 per cent efficiency or better. The most for West Coast is Andrew Gaff with 26, but at just 65 per cent efficiency. Josh Gibson has kicked just his third career goal in his 192nd AFL game. 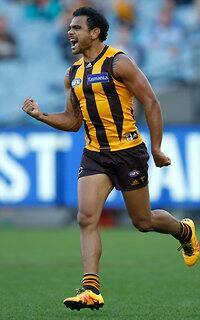 It is his first ever for Hawthorn, for whom he has played 127 matches. Today marks the first time Hawthorn forward Cyril Rioli has kicked four goals since he booted six straight against the Cats in Round 20 last season. Eight of Hawthorn's goals today have been kicked from a distance inside 40 metres. West Coast on the other hand, have scored the majority of their goals, four of seven, from further than 40 metres out. In his first game in West Coast colours after a distinguished six season, 127 game career with Sydney, Lewis Jetta has found the going tough, with seven disposals at just 29 per cent efficiency. In a likely reflection of the AFL's new Interchange cap, key position players Kennedy, McKenzie, Gibson and Frawley have played 100 per cent game time thus far today. Leading tackler on the ground today is Hawthorn's Will Langford with eight, following up on his eight in Round 1. This trait is consistent with his career, where he averages 4.6 tackles per game. After 2.0 last week, and with three goals straight today, Eagle Darling is yet to miss a shot on goal for the season. The Hawks have the last five inside 50s to their credit, resulting in three consecutive majors. While West Coast has improved their disposal efficiency in the third term (up to 74 per cent), Hawthorn has also improved theirs, 83 per cent. The Hawks still comfortably lead this category 77 per cent to 64 per cent for the entire game. Eagles InterchangeJackson Nelson off due to an injury. In spite of their dominance in possession, 235 to 137, the Hawks barely trail in the tackle count, where the Eagles hold a slender advantage, leading 43 to 40. West Coast again lost the disposal count in the second term, 102 to 69, yet were able to win the quarter on the scoreboard, outscoring Hawthorn 4.3 to 3.4. Eagles InterchangeLiam Duggan off due to an injury. Prior to today, James Sicily had four goals in four career games with the Hawks, including a best of two. He has already eclipsed that personal high with 3.1 in the first half. 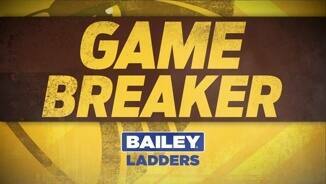 Elliot Yeo had 20 disposals in West Coast's Round 1 victory over Brisbane. In 38 minutes of action so far today he has just the two handballs. Along with his 21 first half disposals (at 86 per cent efficiency), Hawk Gibson has executed five spoils that have resulted in his side gaining possession of the football. Five of the Hawks six goals have come from a possession chain that commenced directly from the intercept of a West Coast disposal. The Eagles have now scored three straight goals from their last three inside 50s. 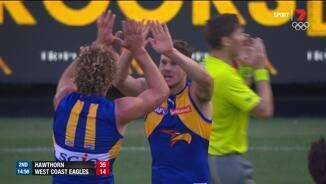 After going without a touch in the first term, West Coast's Jack Darling's first disposal results in a goal. Darling produced 26 majors for the Eagles last season. Hawthorn has 12 of the last 13 inside 50s, and currently lead this category 21 to five. Although their Ruckmen lead hit outs 16 to ten, the Eagles trail in hit outs to advantage, three to four. Josh Gibson averaged 21.9 disposals per game in 2015. After 24 for the Hawks in Round 1 last week against the Cats, he already has 11 in the first quarter today. Hawks InterchangeJonathon Ceglar off due to the blood rule. 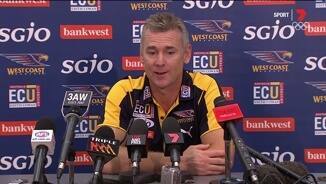 The Eagles disposal efficiency is just 57 per cent. The Hawks are moving the ball at a far better 77 per cent. The disposal count correlates with the Hawthorn lead on the scoreboard. The Hawks lead 79 disposals to 37. The Hawks have seven of the last eight inside 50s, scoring both of their goals during this period of dominance. Hawthorn's Sam Mitchell has nine disposals in the first 11 minutes, including a gameleading three clearances. Ben McEvoy registers his first major of the season. 2015 was his most productive of eight seasons in the AFL in front of goal, where he produced 12 goals (at 92.3 per cent accuracy) for Hawthorn. 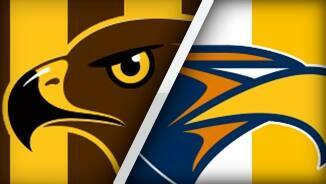 Eagle Josh Kennedy has a per game average of three goals in ten career matches against the Hawks. This compares favourably to his average against the remainder of the competition, 2.2 goals per game. Down the other end at Full Forward for the Hawks is Jack Gunston, who averages 2.1 goals per game against the competition. He had his best season in 2014 when he kicked 58 goals from 23 matches. Welcome to MCG for the Hawthorn v West Coast Eagles Round 2 clash. HAWTHORN has landed a hefty psychological blow on premiership rival West Coast and bounced back from an Easter Monday loss to Geelong with a dominant 46-point triumph in Sunday's Grand Final rematch. On the day injured star Jarryd Roughead unfurled the past three premiership flags, the Hawks reawakened the Eagles' demons with a frightening reminder of their mastery of the MCG in a 14.15 (99) to 7.11 (53) win. There were 14 changes from last year's season-decider – seven on each side – with several big names missing, none larger than Hawks skipper Luke Hodge and Roughead. But six months to the day since they delivered a third-straight flag, Alastair Clarkson's juggernaut got their 2016 campaign rolling with an eerily similar performance – with the final margin matching the Grand Final victory. Hawthorn hunted West Coast at the contest and ran the Eagles ragged with precise ball movement, racking up more disposals (457-292), dominating uncontested possessions (303-153) and inside 50s (68-34) in a commanding display. "We needed to respond from last week's loss. We were really disappointed with our performance against the Cats and we knew we had to play some of our best footy and we were pleased we were able to do that," Clarkson said post-match. "In all three phases of the game, whether we had the ball, West Coast had the ball or when it was in dispute we thought we were strong and that is really important against West Coast." The shellshocked Eagles struggled to get their hands on the ball, but when they did their foot skills were deplorable and their decision-making crumbled under intense pressure. In scenes reminiscent of last October, the writing was the on the wall almost from the opening bounce. Hawthorn dominated field position (19 inside 50s to five to quarter-time) as the Eagles' backline collapsed under the sheer weight of incoming ball and conceded the opening five goals, effectively killing the contest. West Coast scrapped hard to get the game back towards an even keel, but from 21 points down at half-time the result never looked in any doubt. 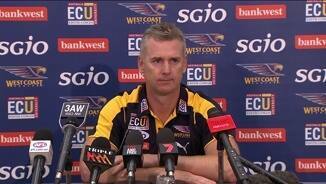 "They outplayed us in every area of the game," Eagles coach Adam Simpson said. 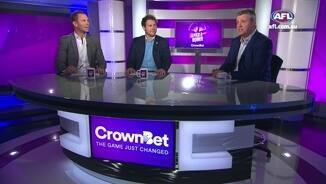 "We just didn't put ourselves in any position to compete – inside, outside or (with our) ball-use. "I thought our defenders actually did OK considering the supply … they probably should've won by more." Reigning best and fairest Josh Gibson ran amok across half-back for Hawthorn, picking up 44 touches - the equal-most disposals of any player in club history - and icing a supreme performance with his first goal for Hawthorn in the final term. Tireless veteran Sam Mitchell (37 disposals) orchestrated the Hawks' midfield, while pacy wingman Isaac Smith (33) and Billy Hartung (32) repeatedly broke the lines and pierced the Eagles' defensive zone. Emerging young forward James Sicily responded to a quiet Easter Monday performance by booting four majors, while Norm Smith medallist Cyril Rioli (four) again haunted the Eagles and Luke Breust (one) caused trademark havoc. The Hawks had winners everywhere but yet again the Eagles had too many passengers. After a poor Grand Final, Eagles forward Jack Darling was one of the few who could hold his head high after booting three goals from limited supply. Last week's eight-goal hero Josh Kennedy – held goalless by James Frawley last October - was forced to work high up the ground to find the ball and tried hard despite only booting the solitary major. Recruit Jack Redden (19 disposals) and full-back Eric Mackenzie never gave up, however ex-Sydney Swans speedster Lewis Jetta (eight) looked out of sorts in a quiet debut. While Hawthorn's quest for a record-equalling four-straight flags is now up and running, the MCG monkey on the Eagles' back is fast turning into a gorilla. They have now lost 11 of their past 14 matches at the Grand Final venue – with two of those wins coming against Melbourne – and Adam Simpson's men have only two more trips to get better acquainted with the football Mecca this season. 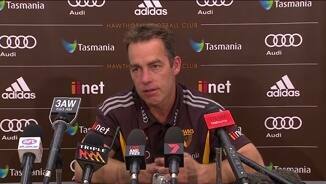 Hawthorn: Luke Breust had a cut to his head that needed attention, but didn't restrict his performance. Ben McEvoy came off for the blood rule from a cut on his cheek in the third term, although it was only a minor nuisance and he played out the game. 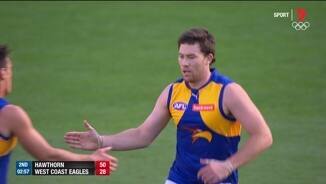 West Coast: Luke Shuey rolled an ankle in the warm-up and the Eagles had to nurse him through, but he and Liam Duggan (ankle) should be fine for the Western Derby. Otherwise the Eagles escaped unscathed. Hawthorn faces another test against the rampant Western Bulldogs at their Etihad Stadium fortress next Sunday, while the Eagles fly home with only a six-day break before facing a crunch Western Derby against a winless Fremantle.